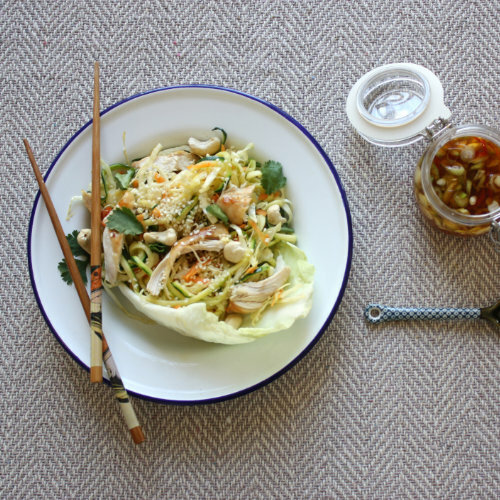 Chicken courgetti noodles are a bit of an obsession of mine at the moment. I think it’s because I love the simplicity of the dish and the way it reminds me of my time living in Thailand. By swapping egg noodles to courgetti, you gain another vegetable, more fibre and vitamins & minerals. The dressing has a nice kick and the overall experience is really fresh, which I also love! 150g chinese cabbage, washed and shredded finely. Pre-heat the oven to 180°C / gas mark 6 and bake the chicken breasts in an oven proof dish for 25-30 minutes (until cooked through). Meanwhile, spiralise your courgettes (or use a julienne peeler) to make the noodles. Heat the olive oil on a medium heat in a large frying pan and add the courgette. Cook for a couple of minutes, making sure you toss the courgette regularly. Season with salt & pepper. The courgetti should be softened, but still have bite. Next, make the dressing by adding the sesame oil and fish sauce into a pan to gently warm. Then add the other ingredients and stir, leaving on a very low heat for a few minutes. Once the chicken is cooked, cut it into small bite-sized pieces. Put the courgetti into a large bowl, add in the cabbage & carrot and mix. Drizzle over and mix in the dressing and sprinkle over and the sesame seeds. Scatter over the chopped coriander and cashew nuts to serve.